How do I apply for a leave, vacation or PTO? Learn about how to use leaves, vacation and PTO's and how to apply for them. You can access your leaves, vacation and PTO from the left menu under my profile or directly from the menu on the top right. Select the leave type that you are looking to apply for from the drop down. Note some leaves are based on gender. For Example, Maternity Leave and Paternity Leave. If you do not find the leave that you are searching for please contact your admin. Note: Only leaves that are assigned to you will be available in this drop down. 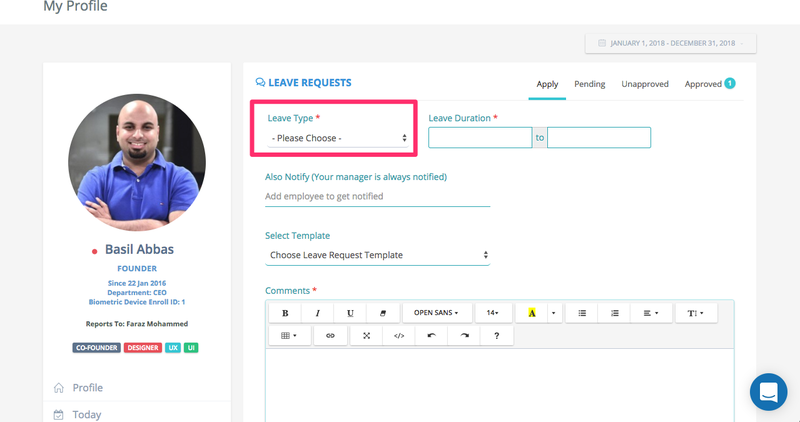 If you are not able to find a leave type, ask your administrator to enable it for you. More about leave setup. ClockIt supports both hourly and days for leaves. Depending on your leave type the next input will be available. 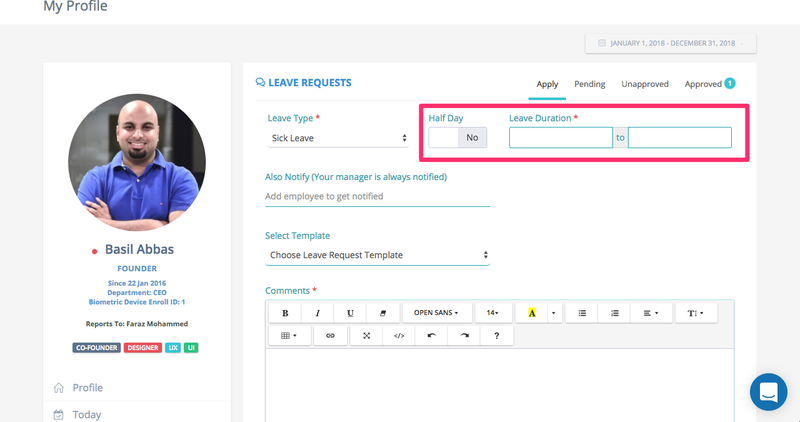 Choose if this is a full day leave or a half day leave and then select the date range for your leave. If your leave is only for a single day, then the TO and FROM dates will be the same. The total number of days will be dependent on the total working days from the TO and FROM dates. Note: Holidays and Weekends will not be deducted from your leave/vacation balance. 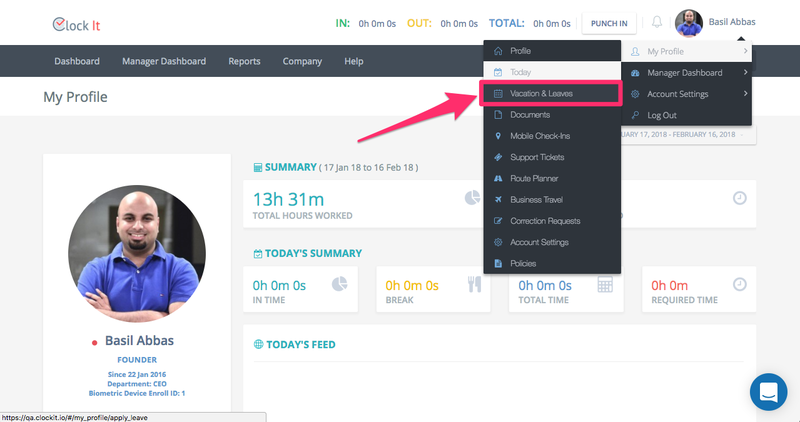 You can also choose to notify additional people in your company regarding your vacation. By default the manager is always notified. 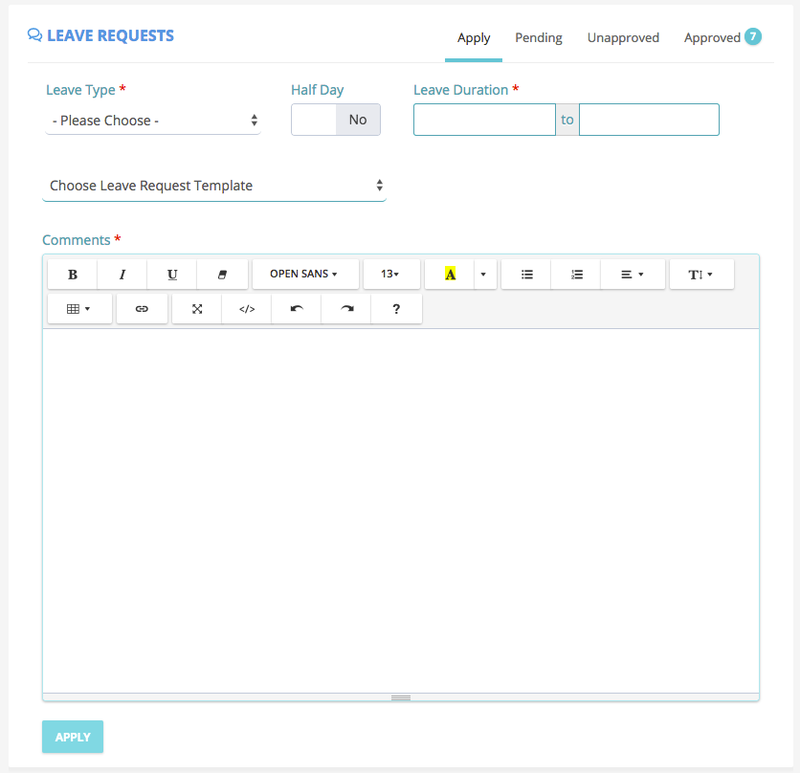 Next, select your leave request template to apply a predefined form and fill in the details in the comments. Find out more about request templates. Once you have completed all the required fields you can hit apply. 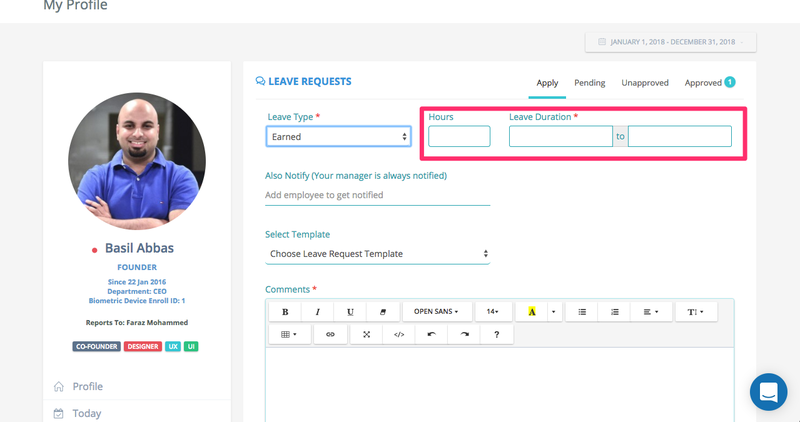 Based on the permission that you have your leave request will be sent for approval to your reporting manager. An email will also be sent to them and you on leave request, approval and rejection. 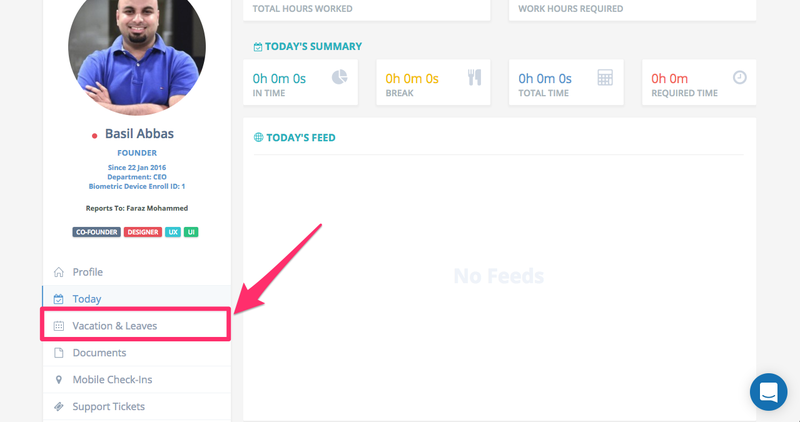 At any time you can see your pending, unapproved and approved leave requests from the tab on top. 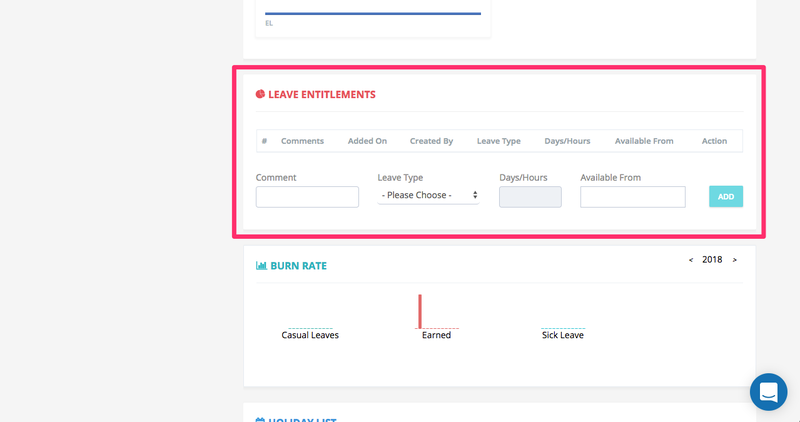 Any pending leave requests will show up as a notification number on the left menu next to leaves. For leaves and vacation that are based on hours. Enter the number of hours that you would like to take and the date range. Selecting 1 hour for a date range of 5 working days will mean 1 hours for each of the 5 days and a total of 5 days will be deducted from your balance. 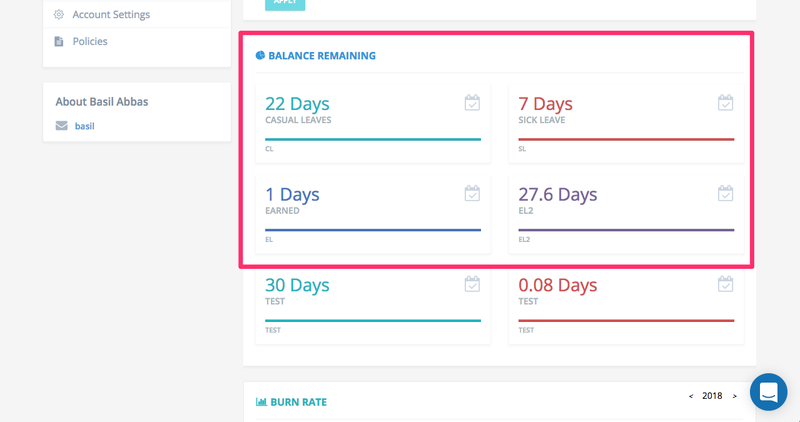 This section will show you your leave balance in either days or hours. The leave entitlements allow you to make modifications and adjustments to the leaves of this user. Based on the Groups and Permissions you may options to see this view and make entries. Enter the comment, the leave you are looking to modify. Enter your adjustment, you can enter both positive and negative values. Enter the date when this adjustment should be available. Click ADD and verify the leave balance. There is a burn rate attached to each leave type. This chart will show you the number of leaves taken per month. Each graph has 12 divisions that denote each month January through December. The holiday list shows all the holidays that you are entitled to. Know more about holiday setup for your company. 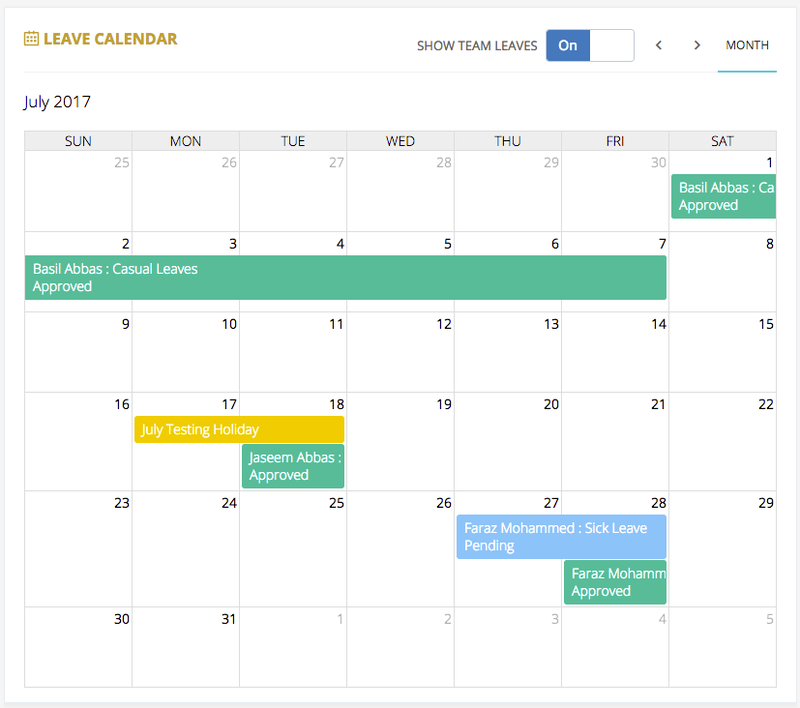 The leave calendar will show you all leaves pending and approved for you and your team. Use the Show Team Leaves toggle to hide and unhide your team members leaves. This calendar also shows the holidays marked in yellow as per the holidays setup in your company.